The audiences cannot face each other. Their eyes may meet by chance, but in that moment they avert their eyes, relying on their visual systems. If two people are facing each other, one of them is not a spectator, but one may be a performer acting out the role of the audience. Let’s talk about the moment when this natural assumption turns out to be wrong. 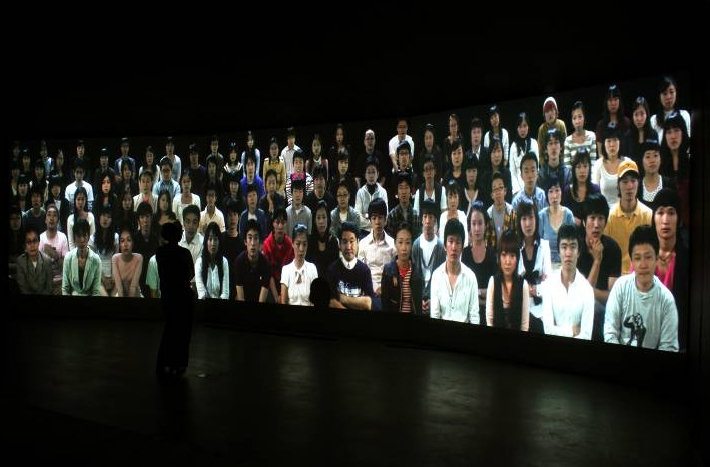 As a viewer, I enter an exhibition venue with three screens. I go there to see something projected onto the screens. When light is projected onto the screens, some shapes appear with the hum of many voices. I think it is time to see a work of art, but suddenly 100 viewers are seated in front of me. They immediately face me. Of course, assuming I am a viewer, they could not be an audience. Therefore, it is easy to conclude that they are performers acting out the role of viewers. 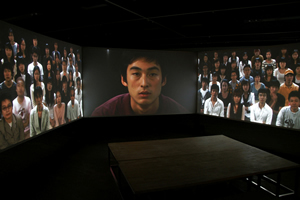 Performers emerge in the place where viewers face viewers. The place where the performers appear is the same screen as where I see viewers. They are performers as well as spectators. Sometimes, one, two, or three people appear and reply to some questions. They make an aside to the audience that the other characters are not supposed to be able to hear. When they are performers, they no longer respond to the other characters, but if they remain as viewers, they respond to the performers’ comments. The figures projected onto the screens are actually all performers and thus cannot hear all the comments there. If this is so, to whom do they respond? Are they perhaps responding to something that is being commented on in my own mind? I myself may not have a chance to appear because the other performers are continuously appearing. 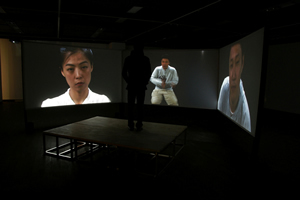 An intersection among the performers, who are busy commenting on their own answers, is captured. I stand on the stage as a viewer but discover that there is room to escape from my comments and to capture and traverse the intersecting point. 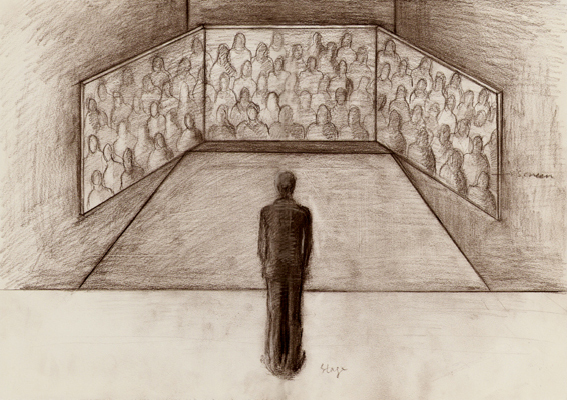 In that moment, I become an actor and the 100 performers turn into viewers. In this exhibition, viewers (performers) face performers (viewers) through a continuous play of changing roles. This being said, it is worth noting the intersection point between performers. 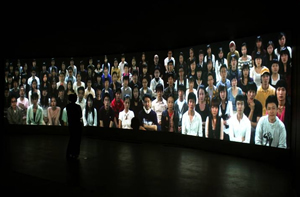 It is a point of viewers and also a point where viewers become performers and also a spot where viewers face viewers. What do the performers comment on? Judging from their comments, they seem to act out the role of artists. Assuming they are artists, they talk about their work, the matter of communication between art and the audience, their attitude towards their work, their work which is to be shown to viewers, and their pride as artists. They remark about their agonies and thoughts as artists in their brief comments. If pursuing the intersections between these comments, we may reach a certain socially accepted idea about the profession of an artist. If collecting information away from this idea, we may approach a new semantic network. This is the information presented to the viewers who visit the venue. Perhaps, most of them are involved in the art scene. (The performers in the work have nothing to do with art.) 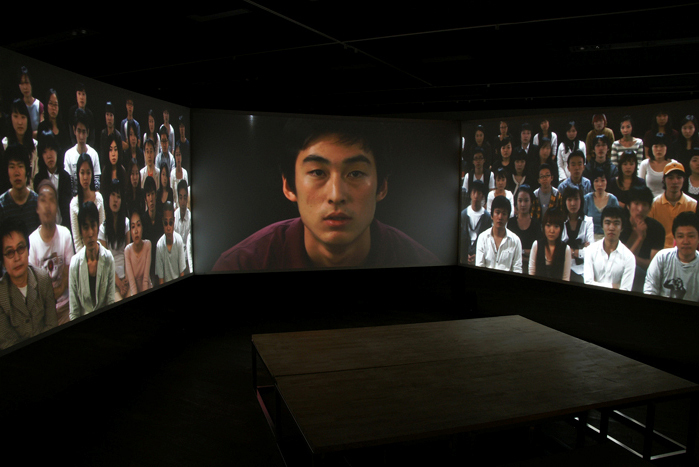 While viewing the acting by performers as viewers, they also are aware that they face viewers as performers. 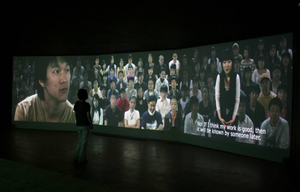 The exhibition title is An Aside by the Audience, not by An Aside by the Performers. If the viewers are unable to hear and only the performers know of the situation, this is no longer a performance. It is just a feast for the performers. Mioon seems to think that artists mutter an aside like the audience. The performer’s seriousness in interviews overlaps the words of An Aside by the Audience. *This article was originally published on Wolganmisool, monthly art magazine in Korea, on Mioon’s exhibiton at Gana Art Space from Feb 25 to Mar 6 2008. 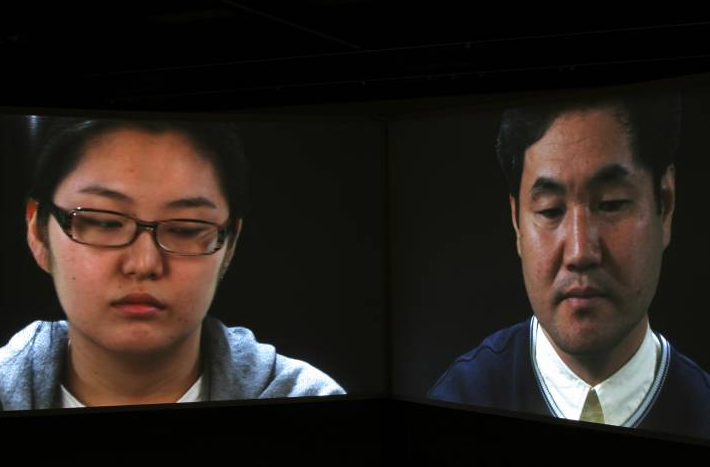 - a painter, a sculptor, an installation artist, or a video artist. Suppose that you are an artist; imagine the look of an artist and briefly answer the following questions in about one sentence. 1. What kind of work are you doing now? 2. What’s your direction and approach to life as an artist? 3. What do people seem to think about you as an artist? 4. Do you think your work can be understood by all? 5. What kind of impact do you want to make on people as an artist? 6. What do you think about posthumously recognized artists? 7. Do you have a strong interest in other people? Do you love them? 8. Do you think you are special compared to the general public? 9. Do you think artists must serve society in some way? 10. What’s your opinion on the fact that only a few people enjoy art? 11. Are you happy when you work? 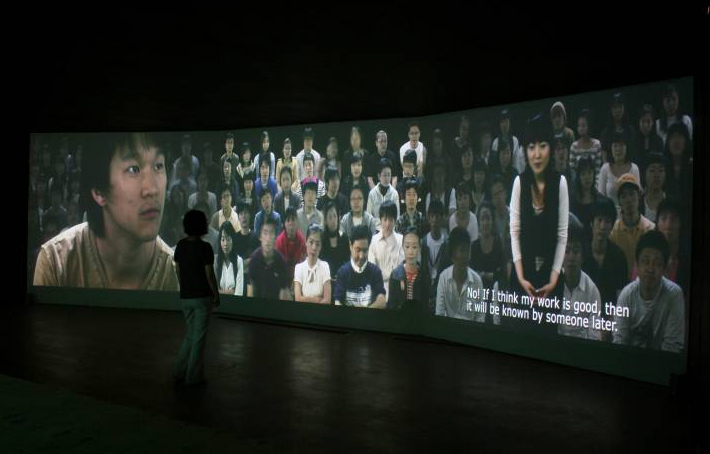 * Used for this video installation Aside of Audience, the above questions were asked in the interviews with those nothing to do with art after supposing they are artists.